Last year, sometime in the summer I believe, I attended my first ever Comic-Con in Boston, Massachusetts. I wasn’t really set on Cos-playing at the time, but I was sure that I wanted to dress up. I decided, since I had beautiful long brown hair at the time, to cos-play Vala Malderan from Stargate SG-1 (the last three seasons). 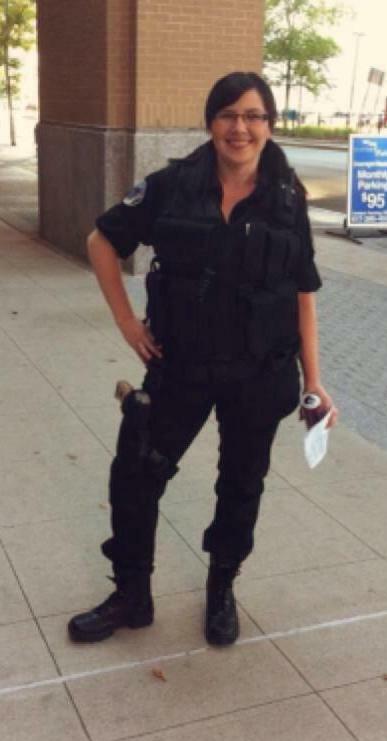 I already had the SG1 black combat uniform because I was Samantha Carter for Halloween a couple years before that.The only thing I really needed to do was straighten my hair and place it in pig tails. Who knew that this would start me on a long journey of Cos-playing that has a never ending future. From that time on I have been contemplating many different characters to cos-play. Recently I have gotten involved in a Lord Of the Rings Costuming group on Facebook, which I met at Emerald City Comic-con this past February. After my SG-1 Cosplay I wanted to step up the game and make my own. Sewing is not new to me. I have made many costumes/outfits in my time but cos-playing is a bit different. It’s a lot more about accuracy and characterization than it is about just making a costume. 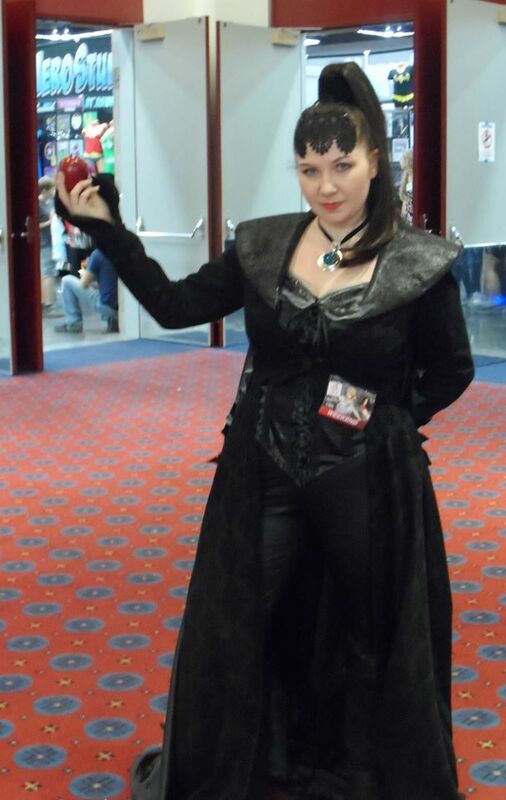 I had picked up a pattern for the Evil Queen from Once Upon A Time, and knew in an instant that was my next adventure. I started by searching many fabric types that could possibly work and be accurate. I also needed to keep it in my price range, which made picking out fabric quite a challenge. However, thanks to the wonderful 50% off coupons I get from Joann Fabrics, I was able to find a brocade fabric that would work perfect. It was still a bit on the expensive side since I needed almost 9 yards of fabric, but thanks to my mom and dad for a generous birthday gift, I was able to splurge a bit. Tuesday, September 9th, I started to make the Evil Queen Cos-play. I was planning on wearing it on Halloween since I wasn’t sure when the next comic-con was that I could attend. That day I got a call from my mom saying that my dad had passed away from a heartache. This news came as a complete shock and in order to keep my mind off of it, I continued to work on the cos-play. It took me two days to finish it, just before I would fly out for my dads funeral and memorial service. The day of my fathers Memorial was the Rose City Comic-con in Portland. Well, since my dad had given me the money to purchase the fabric for this cos-play, I figured, what better way to remember my dad then showing up in my cos-play at comic-con. As I walked around and people stopped to get pictures of me, I was constantly reminded of my dad and how he would be saying, jokingly, “You ain’t got no talent”. It was a phrase I heard quite often from him when I finished a new project or decorated another cake. He said it to remind me how much talent I do have, and I can’t thank him enough for that. After this I was so excited for the next comic-con and all the things I could possibly do. However, the next comic-con I went to, I didn’t cos-play at. Instead I went, supporting my F-Cancer shirt from Stephen Amell, and got to meet him as well. It was a huge moment and I do not regret not cos-playing for that. The next plan was to invade Emerald City Comic-Con with my two cousins. 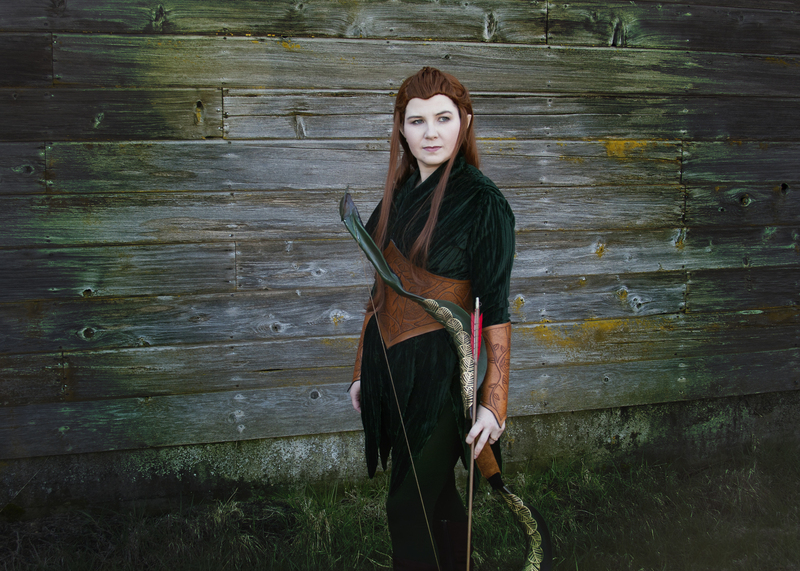 My cousin Jenelle Cos-played Batgirl and I cos-played Tauriel from the Hobbit. This cos-play took the longest to make and had much more fabrication involved. My brother-in-law helped make the leather waist guard and arm bracers after I created the design to be imprinted on it and i made my own bow and arrows out of pvc pipe, craft foam, clay, and other materials. The finished work was amazing and it was the first time I ever had to wear a wig. 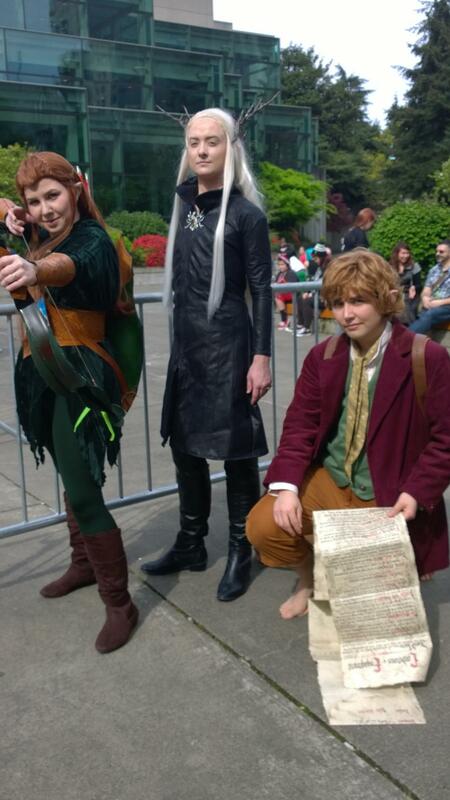 At Emerald City I made a couple friends who cos-played as Bilbo Baggins and Thandruil. Their cos-plays were amazing. I was basically in awe of how much work they put into it. I also knew that I needed to step up my game a bit. They were the ones that told me about the Lord of The Rings Costuming group, which I am now involved in and enjoying the many updates of the cos-plays that people are working on. 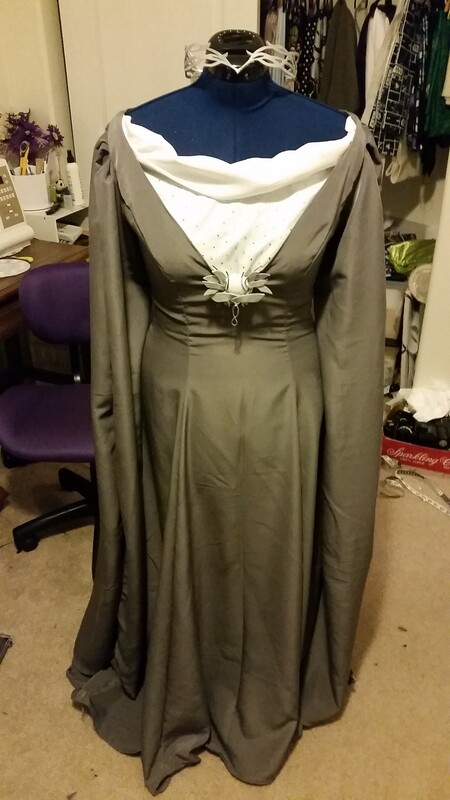 I liked my Tauriel so much that I decided I wanted to make another Lord of the Rings character, so I chose Galadriel. I have not worn this cos-play at any convention, yet, however I have plans to wear it to the next Emerald City Comic-con. For now, I am finished with it and will be doing a photo shoot with my cousin sometime in the near future. My future cos-play endeavors include: Tinkerbell, WWII Peggy Carter and Captain America (with the help of my dear husband), Storm from X-Men, The Winter Sisters (Frozen), Disney Snow White and the Once Upon a Time Snow White, and Cinderlla. I am so blessed to be a part of such an amazing art form. I’ve met many wonderful people along with seeing some amazing cos-plays that I can’t even begin to imagine how to do it. I’m still new to all of this, but its a growing fascination and I’m getting more involved in understanding what it is to be a cos-player. May I never loose sight of what it really means!